Today protesters in Ferguson, St. Louis, Chicago and other cities protested Black Friday and the shopping craze that it has become. 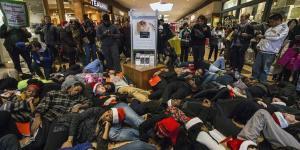 Some protested against people shopping like mad immediately following the trial of Darren Wilson, while others protested against the commercialism that this day brings, and only a day after Thanksgiving. Man, I wish I could have been there. I wish I could have laid down on the shopping mall floor or stood outside with a sign peacefully sharing against commercialism. We have a voice, and we need to use it. We cannot just sit idly by as injustice goes on around us. We have to speak up, regardless of what others around us are doing. I wish I could have been there during the civil rights marches. I wish I could have stood on that bus next to Rosa Parks as she refused to move to the back. I wish I could have marched with Dr. King as he peacefully demonstrated agains racism. We have the freedom and the right to stand for what we believe is true and just, what are we doing with that freedom? I am not dogging shopping, nor am I against shopping the day after thanksgiving for a sale, but at what cost? Lets not live out lives based on sales, bargains and culture, lets live our lives based on the word of truth, Gods word. Lets live our lives out of a conviction to make the world a better place and set the example for the generation coming up after us.